The Islamic State of Iraq and the Levant (ISIL) has established itself as an extremely powerful jihadist army in the heart of the Middle East. The group is well armed, commanding a vehicle fleet that includes 2300 High Mobility Multipurpose Wheeled Vehicles (HMMWV) and countless others along with enough weaponry and soldiers to manage a “state” of 300,000 square kilometers (roughly the size of Italy). ISIL is not just powerful, it is well funded. The group is reportedly so wealthy some members of the United States Government, without any apparent fear of hyperbole, repeatedly describe ISIL as the “best funded terrorist group in history” with oil as its main source of affluence. The narrative is an attractive one. A wealthy terrorist group is novel and alarming. Fighting it requires new methods, new powers, and indeed new budgets. But it seems infeasible for the so-called Islamic State to accumulate wealth by selling functionally useless crude oil or poorly-refined petroleum products a truckload at a time. Survival alone must be very expensive indeed while under constant armed assault by a US-led coalition of 65 countries, along with Syria, Russia (arguably), Iran, and countless rival groups including the very capable Hezbollah. This gives credence to reports that some Sunni Arab states (allies of the United States) look the other way while their prominent citizens support the group. Whatever the case, the mainstream media seems unwilling to question the narrative of ISIL’s oil riches. The numbers however, do not support this idea. Estimating ISIL’s oil revenue is complex and based largely on assumptions and derived intelligence but is useful for making the point that the group will have great difficulty profiting from the sale of stolen petroleum. A generous estimate put ISIL’s February 2015 production capacity at 50,000 barrels per day (bpd). With a market price of $10 a barrel according to one Iraqi official, ISIL could theoretically make $15 million a month. But there is more to the story. ISIL does not control a single pipeline from origin to destination meaning they require 181 standard tanker trucks just to move all that oil, a very inefficient and expensive transportation method. Standard trucks of this type would require roughly four barrels of diesel just to make the 800-mile round trip from Kirkuk to Raqqah. That is 724 barrels per day ($217,000 per month) just to deliver to potential customers. But ISIL needs fuel as well. A large percentage of ISIL’s estimated production would be consumed by 2300 HMMWVs, hundreds of armored vehicles, likely tens of thousands of civilian cars and trucks, heavy machinery for construction and survivability, generators, and heaters. With only about 70% of refined petroleum products useful for those purposes, ISIL’s for-sale inventory is down to somewhere in the neighborhood of 30,000 bpd. Subtract another 10% for likely corruption, loss, fuel contamination due to mishandling, and inefficiencies from distributed and improvised refining, that is 27,000 bpd before accounting for a single action by any of ISIL’s many enemies. 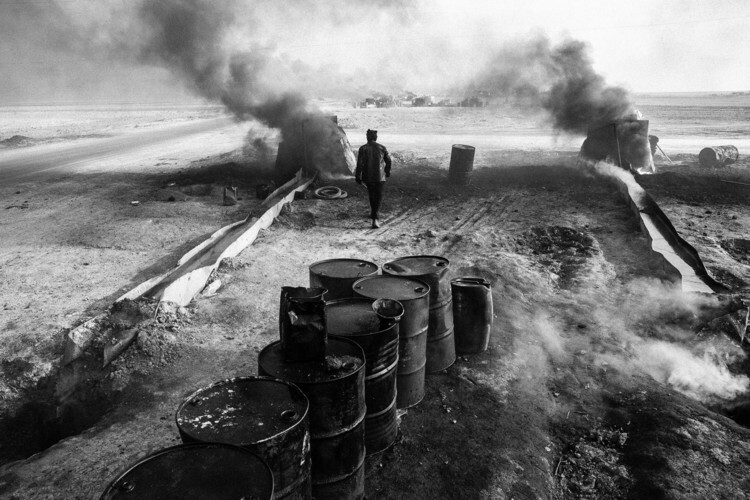 “Crude Stills:” A field refinery used by ISIL to process crude oil into useable forms such as diesel and kerosene. All the same, 27,000 bpd is worth $8.1 million per month; not a paltry sum, but a far cry from the $50 million bonanza the United States estimates ISIL earns monthly from oil sales. It is also only one half of the equation. Though ISIL’s monthly expenditure is beyond the scope of this article, we must remember that its army of tens of thousands of soldiers is a very expensive commodity to operate. Those soldiers must be recruited, fed, paid, housed, equipped, armed, and trained. The wounded require expensive medicines to heal or keep healthy and their families must be compensated upon their deaths. If we compare these priorities with appropriation titles in the budget of the United States Army, we find that similar expenses account for 91.8% of the total US Army budget. Assuming ISIL has similar combat priorities, it is clear $8.1 million will not go very far. eason we keep hearing tales of the group’s fabulous riches. Since the Obama Administration began perpetuating the myth of ISIL’s oil wealth in August 2014, bureaucrats and generals have used the idea as a foundation for action. As early as September 2014, the Department of the Treasury sought authorities to target ISIL’s bank accounts and those of its financial backers while the State Department lobbied to block donations to ISIL from citizens of Gulf Cooperation Council countries. Meanwhile, the Pentagon went after the group’s oil infrastructure, most notably in an effort to retake the Bayji refinery complex. Though this seems a refreshingly comprehensive approach to a complex problem, these agencies carried it out in the context of bureaucratic competition, particularly when diplomacy constrained military options or when bombing annoyed regional allies and complicated negotiations over the Iran nuclear deal. Yet amid the bureaucratic maneuvering, none were willing to question the attractive but invalid assertion that ISIL was making a lot of money…Until Vladimir Putin agreed with them. Following the downing of a Russian fighter aircraft by the Turkish Air Force, Russia produced photo evidence accusing Turkey of being the primary consumer of ISIL’s stolen oil. The Russian photos even implicated the family of Turkish President Recep Tayyip Erdogan in the trade. Despite their ambiguity, the allegations are troublesome for the mantra underpinning the policies of the United States, NATO, Turkey, and a number of other outwardly anti-ISIL stakeholders. The response from the United States came from special envoy and coordinator for international energy affairs, Amos Hochstein, who said that ISIL’s oil sales to Turkey are of “no significance from a volume [or revenue] perspective” and that most consumers are in ISIL-controlled areas of Syria and Iraq. Bizarrely, other US officials even questioned ISIL’s production capacity, pointing out that the group refines its stolen oil in “ad hoc desert pits equipped with crude stills”. Suddenly Washington was further complicating an already confusing policy by qualifying its previously bold statements about ISIL’s oil wealth. Maintaining the myth of ISIL oil wealth was always an operational liability, incorrectly informing policy and improperly shaping decisions on the use of national power. It is now clear the tortured logic required to maintain the fiction is an international political liability as well and it is time for the United States and its allies to face facts and abandon the groupthink. ISIL is not enjoying a massive windfall from the sale of oil and instead is waging a successful war with more intractable sources of funding including possible covert sponsorship from some of America’s less scrupulous Sunni allies. Until Washington is willing to face the reality of ISIL’s oil wealth, those “allies” will enjoy political cover to support the Islamic State and Mr. Putin will continue to use America’s own rhetoric against it.